Located on 4.4 acres on beautiful Windermere Point, the first recorded burials were in 1886. The tombstones tell the story of early settlers, miners and soldiers who lived and did in the Windermere Valley. Old maps show the cemetery divided into thirds, Protestants, Catholics and Others. 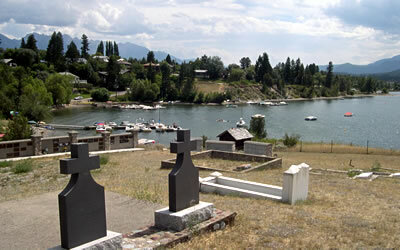 In 1972, the cemetery property was transferred to the corporation of the Village of Invermere, the closest official town. In 1984, the cemetery was declared an historical site under the Heritage Conservation Act, and it is currently owned by the District of Invermere. In 1997, the Windermere District Historical Society and the Rotary Club of Invermere constructed a columbarium and memorial wall.